The United States Senate is the upper chamber of the United States Congress which, along with the House of Representatives, composes the legislature of the United States. 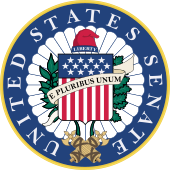 The composition and powers of the Senate are established by Article One of the United States Constitution. The Senate is composed of senators who represent each of the several states, with each state being equally represented by two senators, regardless of their population, serving staggered terms of six years; with fifty states presently in the Union, there are 100 U.S. Senators. From 1789 until 1913, Senators were appointed by the legislatures of the states they represented; following the ratification of the Seventeenth Amendment in 1913, they are now popularly elected. The Senate chamber is located in the north wing of the Capitol, in Washington, D.C..
As the upper house, the Senate has several powers of advice and consent which are unique to it; of these include the ratification of treaties, the confirmation of Cabinet secretaries, Supreme Court justices, federal judges, other federal executive officials, flag officers, regulatory officials, ambassadors, and other federal uniformed officers. In addition to these, in cases wherein no candidate receives a majority of electors for Vice President, the duty befalls upon the Senate to elect one of the top two recipients of electors for that office. It further has the responsibility of conducting trials of those impeached by the House. The Senate is widely considered both a more deliberative and more prestigious body than the House of Representatives due to its longer terms, smaller size, and statewide constituencies, which historically led to a more collegial and less partisan atmosphere. The presiding officer of the Senate is the Vice President of the United States, who is President of the Senate; in his absence, the President Pro Tempore, who is customarily the senior member of the controlling party, presides over the Senate. In the early 20th Century, the practice of majority and minority parties electing their floor leaders began, although they are not constitutional officers. CNN's Brooke Baldwin analyzes moments on the Senate floor amid tension from the proposed Graham-Cassidy health care bill. Live coverage and analysis of Facebook CEO Mark Zuckerberg's testimony before a joint hearing of the Senate Judiciary and Commerce committees.